A number of factors will determine how often your dryer vent should be cleaned. Longer than normal drying times is a sign the vent is clogged. Most dryer vents should be cleaned out at least every two years. 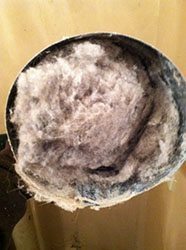 The length of the dryer vents, number of people in the home, and number of pets may lead to more frequent dryer vent cleanings.